Tillie McCroskey “slipped the surly bonds of Earth and touched the face of God” on Monday morning, March 17, at 5:49am. She was born in Goessel, Kansas on May 22, 1926. She was the 2nd of 6 children born to Alvin and Mollie Schmidt. At the close of World War II, one of the returning servicemen was a high school classmate of Tillie’s brother. His name was Bob McCroskey. When Bob got back to Fredonia, he made it a point to renew his friendship with Tillie, and a week later he proposed. They were married on February 10, 1946 and had three children: Bob, Carolyn and Melanie. 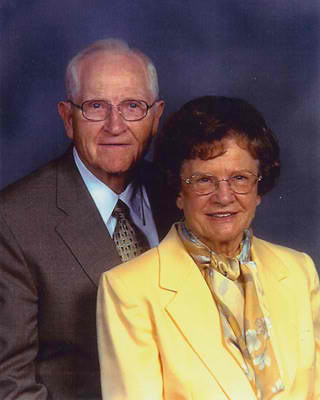 Bob and Tillie felt called to missions and were assigned as missionaries to the Philippines in 1956. They served the church for 37 years working primarily in evangelism and church planting activities. They served in various parts of the Philippines, but mostly in Metro Manila, Central Luzon, and the Southern Tagalog area. Bob was elected as the District Superintendent in the Philippines in 1963. Tillie was particularly known for her creative ministries with children through story boards and flannel graphs. The McCroskey’s also served the church in Hong Kong and Indonesia. Tillie was preceded in death by two younger brothers, Ron and Ray. She was also preceded by her husband, Bob, in 2008. They had been married 63 years. She is survived by one brother, Milford (Lois) of Clinton, Missouri; two sisters, Alma, of San Antonio, Texas and Jane (Aaron) of Fredonia, Kansas; three children, Bob Jr. (Rosa) of Bethany, Carolyn Rowe of Oklahoma City, and Melanie Hykes (Bill) of Oklahoma City; five grandchildren, Kim Anderson of Oklahoma City, Traci Kindred (Torrance) of Seattle, WA, Aimee Doss (Robert) of Oklahoma City, Kara McCroskey of Austin, TX, Kent McCroskey (Aimee) of Bartow, FL; and 12 great-grandchildren, Mychajlo and Samuel Doss of Oklahoma City, Josiah, Levi, Sarah, Hope, Eden and Jesse Kindred of Seattle, WA, Connelley, Campbell, Coleson and Collier McCroskey of Bartow, FL. Funeral services will be held Friday, March 21, 2:00pm at Bethany First Church of the Nazarene with interment in Bethany Cemetery. The children would like to honor their mother’s memory by establishing a memorial in her name. The memorial will be used to help defray the catastrophic medical expenses of Pastor Agus, a Nazarene pastor serving in Indonesia. Contributions may be made to Bethany First Church of the Nazarene, marked Tillie McCroskey. The Church of the Nazarene here on the Asia-Pacific Region extends our greatest heart-felt appreciation to the McCroskeys for their sacrificial service to the growth of the church in Asia. Please keep the entire family in your prayers! Our family have a good memories of mrs Tillie McCroskey a few years ago. At our house in Western Australia we shared at meal table ….me and my wife offer deepest condolence to pastor Bob and his family .hope your family is surrounded by the love of many.